As my life has rocketed through the years, I was 49 orbits around the sun since the word "Westtown" carried much meaning outside of my proudly mentioning it in casual conversation. Westtown is a private, Quaker, co-educational school located in eastern Pennsylvania. I attended Westtown for my freshman and sophmore years. I had only one contact with my old roommate Syd Craig since 1961. This was a chance occurrence at a Quaker Meeting in North Carolina. I returned to public school for my last two years of high school. The deciding factor to not return to Westtown was my new ownership of a 1936 Chevrolet. This handy tool spelled "FREEDOM" in my mind. Forget the good education, a promising future and two more years to soak up the wisdom of Westtown. My world vision, at that time, was no further than the stop sign at the end of Ridge Ave.
Fast forward to earlier this year, a link to my past came out of cyberspace. 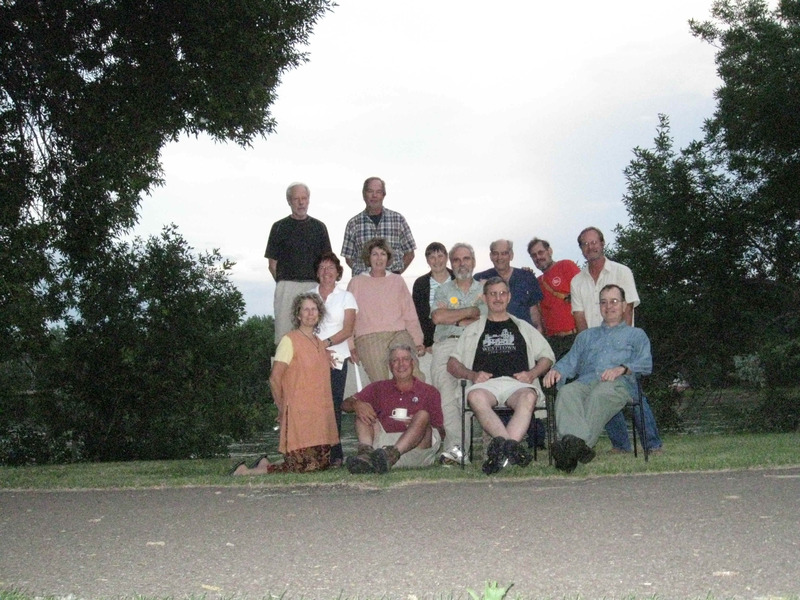 Dave Andrews contacted me and invited me to join a Westtown newsgroup. I did. As the months went on, it became a little treasure trove of information associated with people from two of the most formative years of my existence. Someone suggested having a reunion. Not all were able to attend at any given time or location. However, two reunions did occur, one on the East coast and a small one on the West coast. In addition, at some point, someone suggested a river trip. Several people jumped on the idea. I waffled for a long time. There were a million and one reasons not to go. I didn't really know anyone. Who would these "strangers" be. There was the expense. Tanya and I have always tried to live with a certain eye towards simplicity, in my case I have successfully limited my exposure to work. This seeming wrong-headed approach to modern life has given me a certain flexibility and also a certain poverty. In the past several years I have managed to become a near-recluse. As the weeks wore on, a little voice inside my head kept saying, "you'll regret this if you don't go". With two weeks left, I caved into the idea. From that point forth, the adventure began. It was with great enthusiasm that I began to sort through my camping gear. I needed to arrange all of my stuff. The gear would go on top and inside the kayak. I would not be in a canoe due to the odd number of people. I would have no canoe mate. This was a mild reminder of my being housed in 'solitary' at the Stone House at Westtown. In this case however, I had access at anytime to anyone. It would be marvelous. I packed the rental car and hit the road. It would be 1500 miles with one stop in Portland to visit with family members. The trip to Montana covered three days. I camped out twice, preparing for a week on the river. I arrived in Ft. Benton early in the day. My first priority was to find a T.V. and watch the rest of the World Cup final. The local bar had the game. I had listened to the first half in the car. The game went to penalty kicks, keeping the excitement alive for another hour. Finally Spain pulled it off and I immediately headed to the Grand Union Hotel to see if other Westtonians had arrived. Indeed they had. The reunion was off and running. There was a glorious dinner for 15 at the hotel in the evening. Afterwards we took the obligatory photos, chatted for a while then retired. Each had the growing sense of the impending adventure. The group reconvened early on Monday morning. Last minute details concerning the car shuttles and van retrieval were ironed out. Then the caravan of cars and canoes headed to Coal Banks, the point of departure. There was a flurry of excitement and activity at the launch ramp. 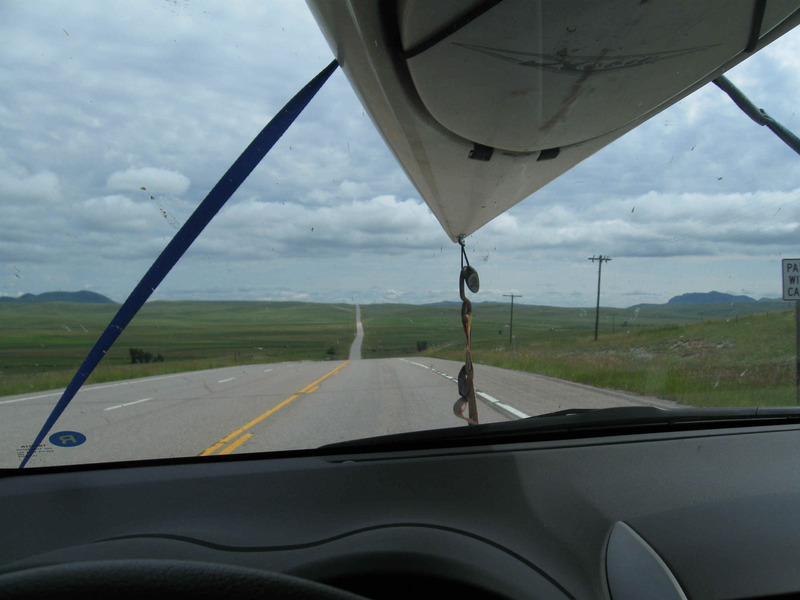 Each of the seven canoes and my kayak were loaded for the journey. I was nervous about the shear amount of weight in the boat. Although I had camped with the kayak previously, I had not carried so much gear. Would it float? As we eased into the water my fears were laid to rest. The kayak sat low in the water, but it was very stable. We were off! The river was running high. The late and wet spring kept the river full and moving swiftly. It would lubricate the miles and make the journey relaxed and comfortable. All seven canoes and my kayak were in the water. Everyone was set, the boats were stable and the wind for the moment was at our backs. 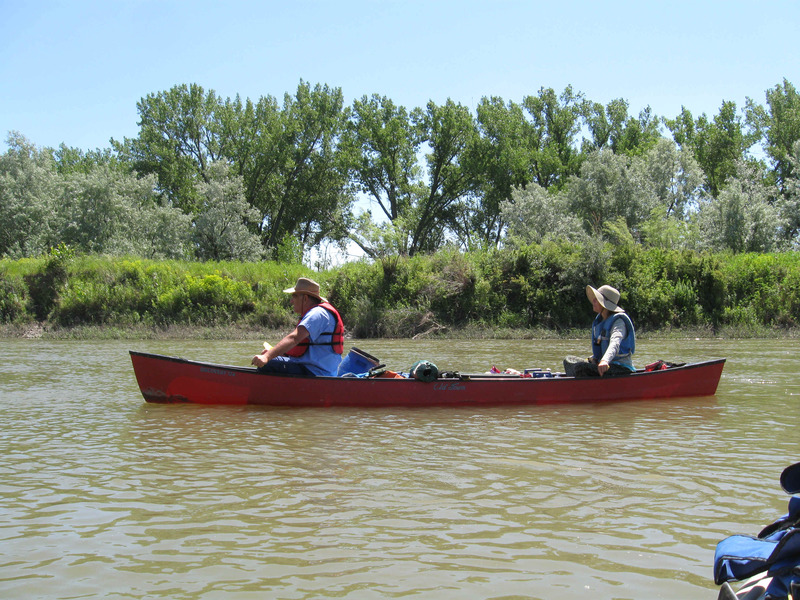 I watched Ned paddle with his grand daughter into the current. His smooth, strong paddle strokes gave me a feeling of security. I knew we were in good hands. Tim and Terry hit the water with enthusiasm. Dave and Arlene's experience was evident from the start. They would keep us within the confines of order, direction and detailed information. Winnie and Tom were paired. They would both weave a bright artistic narrative into the fabric of the experience. Syd and Frank teamed up to add depth and character to the group. Eric H. and Dan would rocket the Allagash down river leaving a wake of inspiration, fortitude and camaraderie.Tina carried not only the other grand daughter, but quietly nurtured the experience to its full term as a happy and healthy adventure. 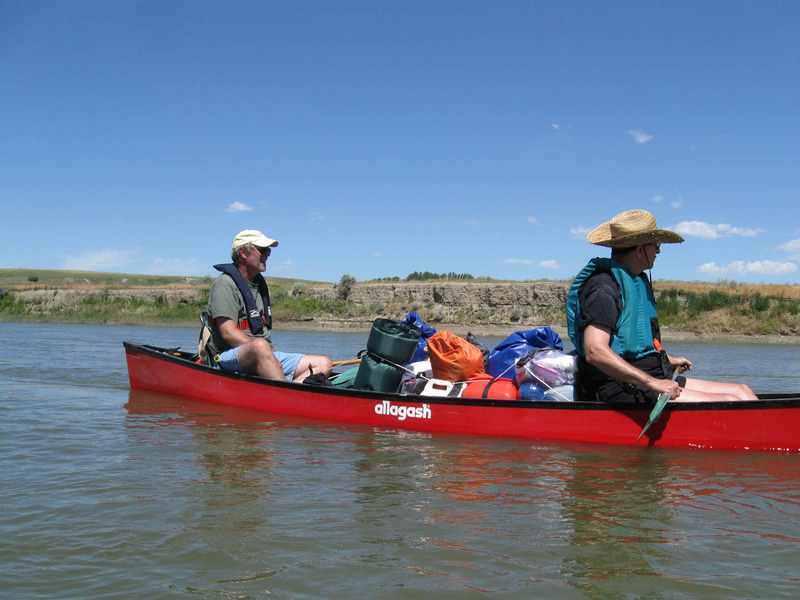 Several of the paddlers would change seats during the journey. The couples stayed together, Eric S. stayed in the kayak. 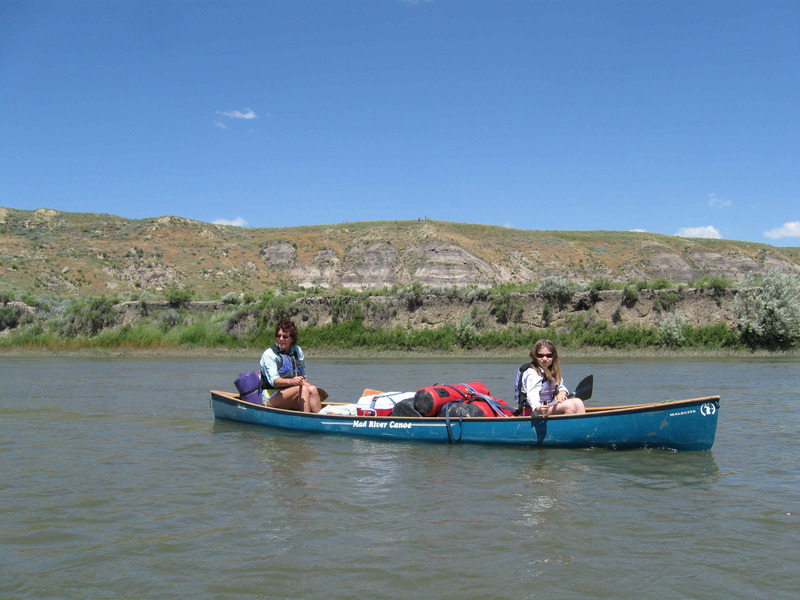 The swift water became a metaphor for the trip itself. I've experienced several occasions of such enjoyment and fun that time seemed to go in fast-forward. This was such an event. The anxiety quickly fled as the trip began to take shape. The water was tame, there was no dearth of drinking water and supplies . The only thing left to do was to drop all of the shackles connected to the outside world and be in the present, to be in this scenic and somewhat wild setting. The die was cast. It would be impossible to turn back. One had only to go with the flow, come what may. The next six days were days of discovery. For me it represented the best possible outcome for all of my previous doubts. The entire group was a collection of unique, interesting and friendly people. In the mix was a wide spectrum of characters. There were academicians, professional people and tradesmen. To round out the group we had two very precious grand children who bravely chose this adventure, who brought with them the simplicity, the joy and the innocence of youth. The pace of the trip was ideal. We were never rushed. 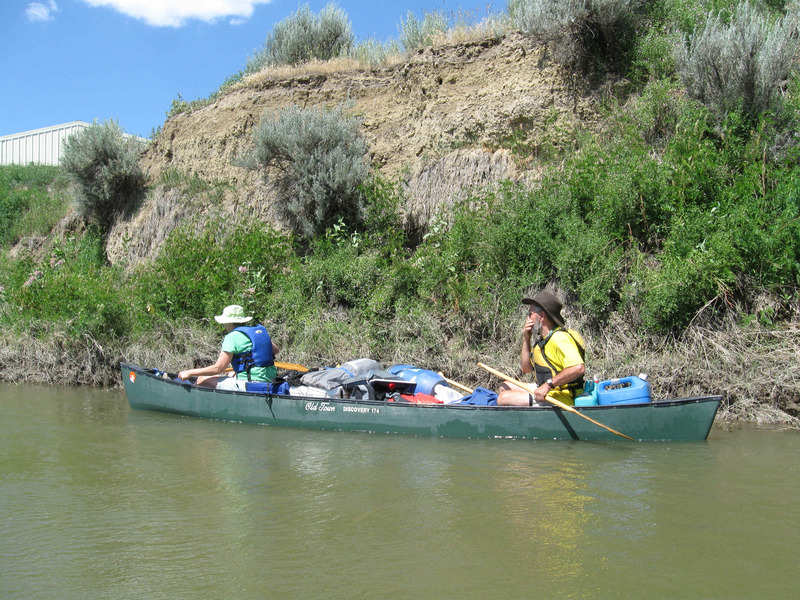 The fast moving river combined with a moderate amount of paddling yielded great distances. There was time to stop at many notable sites and explore. Many of the group took advantage of hikes to exceptionally scenic spots. 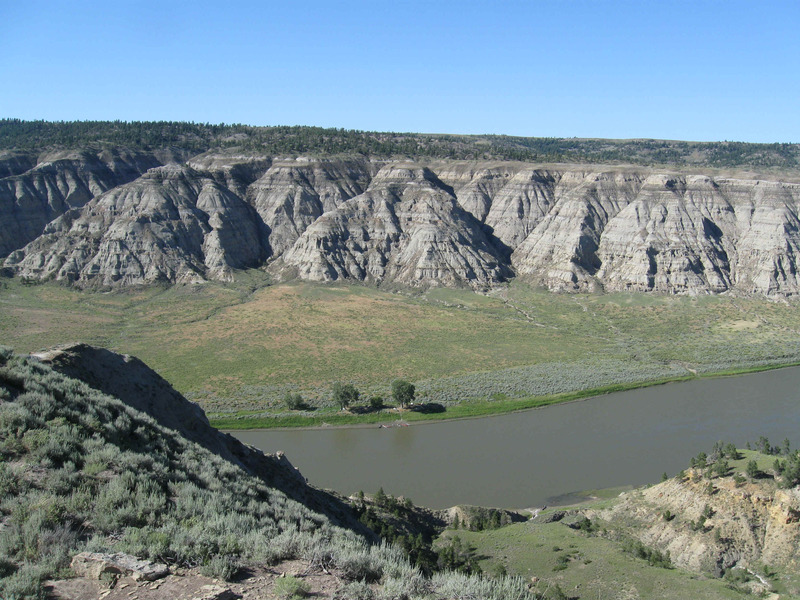 The trip covered 100 miles of remote, picturesque territory that was in part, the route of Lewis and Clark. 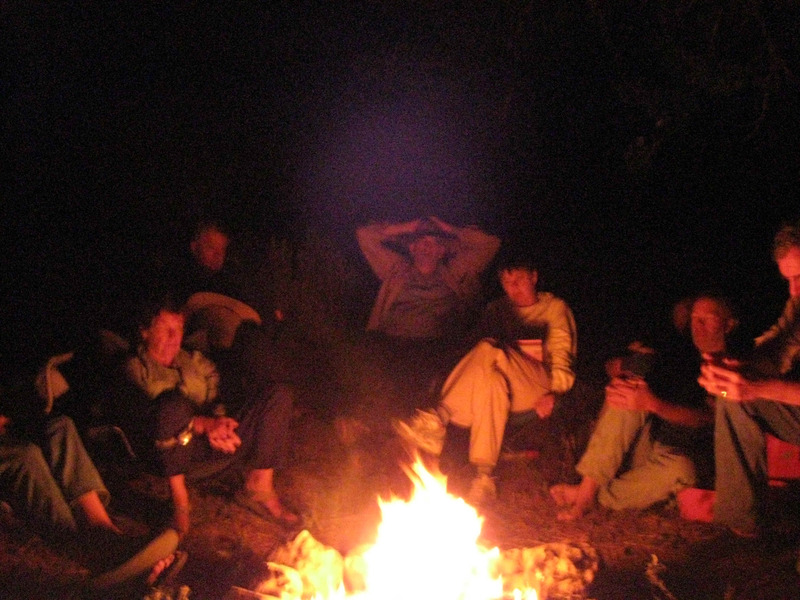 About the fourth night, sitting around the campfire, Tim started a round robin discussion. He talked of his relationship with his sons. He courageously laid open a vulnerable aspect of his being. His heartfelt speaking encouraged other to share. 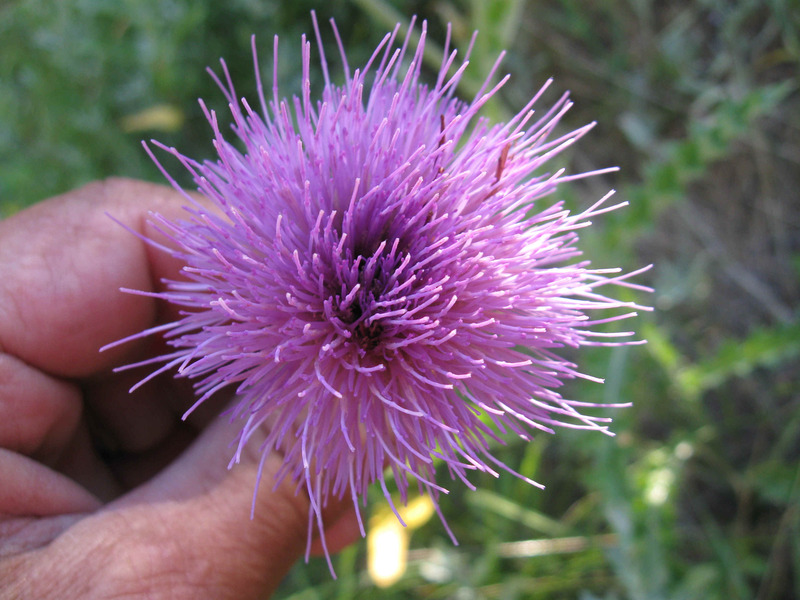 This led to a level of bonding and companionship that people rarely experience. Each had something to say, and each found the strength to open doors not often used. 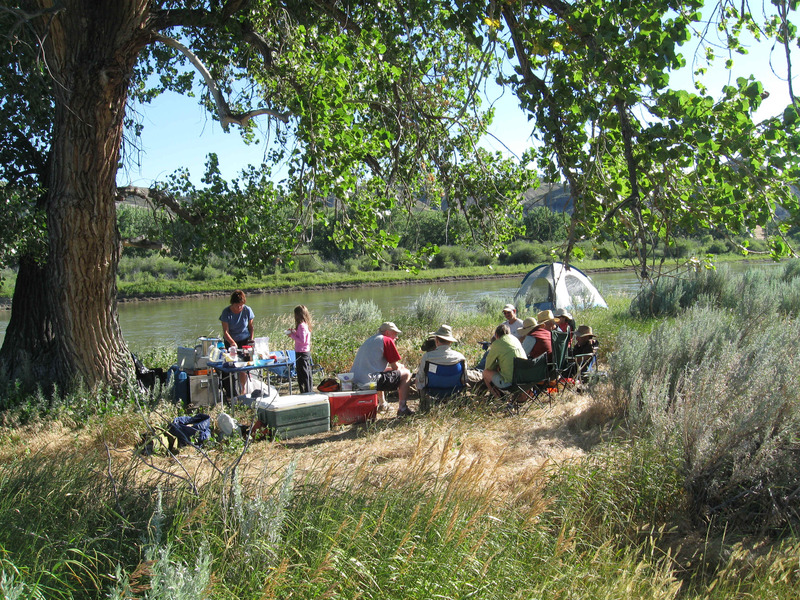 We had selected a campsite for the last night on the river. Several sorties went ashore and scouted the area. It was deemed unfit. The mosquitoes were rampant and the 'feeling' just wasn't there for this sight. 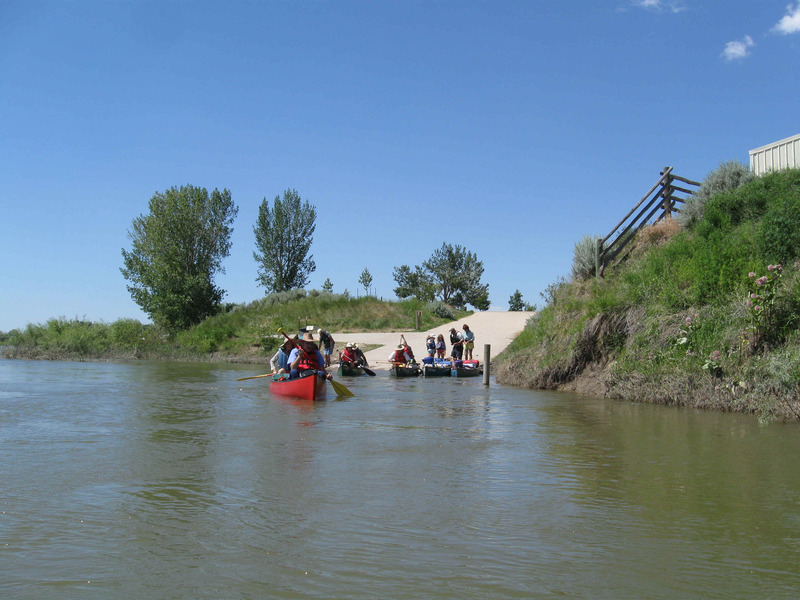 The group came to a consensus to journey on and find a suitable place down river. It didn't take long to spot a lone Cottonwood on the bank. There was even a small eddy to make landing easy. Swiftly and efficiently the nomadic community set up camp. This evening the group was again treated to a gourmet (by camping standards) meal. Food in the wilderness takes on a special flavor. Tim went to extraordinary effort to retrieve firewood by paddling solo across the fast-moving river where more trees stood. He returned with a full canoe. It would provide fuel for the evening and be the nimbus of energy for the group to celebrate this trip. When the last light of the day faded, the campfire blazed. A sublime aura of grace descended upon the group as singing began. For a long time we all dug out our favorites from the past. We sang the classics and the frivolous. Arlene's voice was angelic. Each added a tone and quality that yielded a peaceful, easy feeling. The last day on the river was one of mixed feelings. We had accomplished a great mission. Nothing went wrong. We were the chosen few for the week. There was relief that it was over at the same time there was sadness that it was over. For me, it energized my spirit in a way that will travel with me for the rest of my days. This simple, ancient nomadic activity has a way of tapping into the most deep and primal areas of our lives. This temporary community got to experience each other more deeply than most ever get to know.